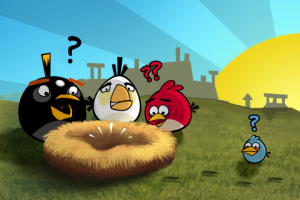 Unless you’ve been living under a rock this past year, you have definitely heard about the widely popular game Angry Birds, but perhaps you’re not really sure what it’s all about or what’s so great about it. Launched in 2009 by Finland-based entertainment company, Rovio, the game has enjoyed immense success and has received winning reviews from gamers and media alike. Since 2010, the game has become an international sensation, as it is not only the number-one paid smartphone app in the United States, but also in countries across the globe including Singapore, Chile, Hong Kong, Romania, New Zealand, Poland and pretty much every other country you can think of. Angry Birds has become so popular that it is now not only found in video games or iPhone apps, but also as card games, action figures, t-shirts, stuffed animals, magnets, costumes, cell phone covers and keychains, to name a few. Don’t be surprised if they show up on your living room LCD TV as a Saturday morning cartoon. In fact, CNN has reported that an Angry Birds theme park facility was opened this September in Changsha, China. A recent flight on Finnair celebrated all things Angry Birds by having an Angry Birds themed flight – complete with exterior Angry Birds decals, flight attendants in Angry Birds costumes and Angry Birds themed menus. Perhaps what has added to the success of the game has been the huge increase in portable internet devices. The game can be played on not only smartphones, including iPhone and Android-powered devices, but also on laptops, tablet PCs and some MP3 players. The growing market and availability of mobile electronics allows games like Angry Birds to benefit from increased time spent on these devices, and therefore more time spent gaming. Angry Birds surely doesn’t look like it’s going anywhere anytime soon, so consider taking the time to try out the game on your tablet or smartphone – you might just understand what all the fuss is about.